As we reflect on the past this New Year at Baltimore Heritage, we’re looking a bit farther back than usual — 200 years back. 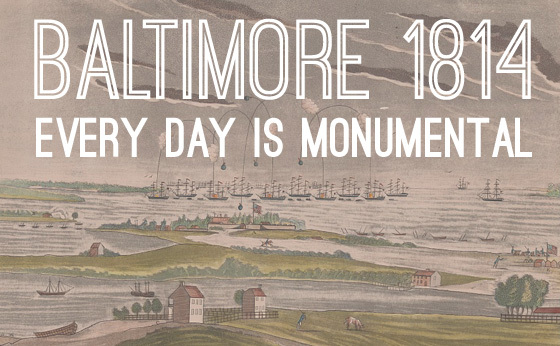 Throughout 2014, we’re sharing hundreds of stories to give you a glimpse of everyday life in 1814 — a monumental year in Baltimore’s history. Baltimore 1814 is an online collection of short stories on the history of Baltimore, the War of 1812, and the world of 1814. Throughout all of 2014, come back for new short stories and excerpts from primary sources highlighting everyday life in Baltimore from that day in 1814. Most of our stories are set in Baltimore but occasional features on events in Maryland and around the world will help us see our city’s history in a broader context. Learn more about our Baltimore 1814 project. What was Baltimore like in 1814? As 1813 came to a close, nearly 50,000 people lived in Baltimore and the surrounding precincts, among them 5,000 enslaved blacks. Only Philadelphia and New York boasted larger populations and Baltimore had the bustle and bravado of a booming young metropolis. Learn more about the history of Baltimore in 1814.